An accurate image registration of MRI to CT data is of great benefit for prostate treatment planning in image-guided radiotherapy. However, prostate motion with respect to surrounding structures and absence of clear structures in and of the prostate in the CT image, complicate this registration. 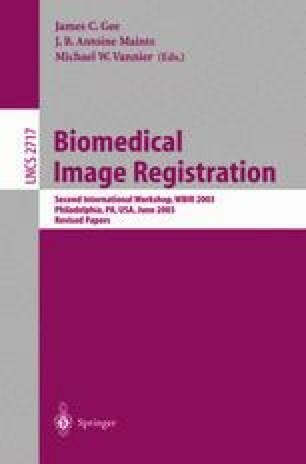 Therefore, we developed a semi-automatic method for a robust, accurate and time efficient image registration of MRI to CT data of the prostate, making use of gold markers, that are inserted in the prostate, as fiducials. The gold markers, as they appear on both images, are segmented using a thresholding technique. The registration deals with a rigid transformation and is based on the iterative closest point algorithm that acts onto the surfaces of the segmented gold markers. The method is clinically tested and uncertainties of 0.4-0.5 mm and 0.7-1.4 mm are obtained at the centre and at the rim of the prostate, respectively.